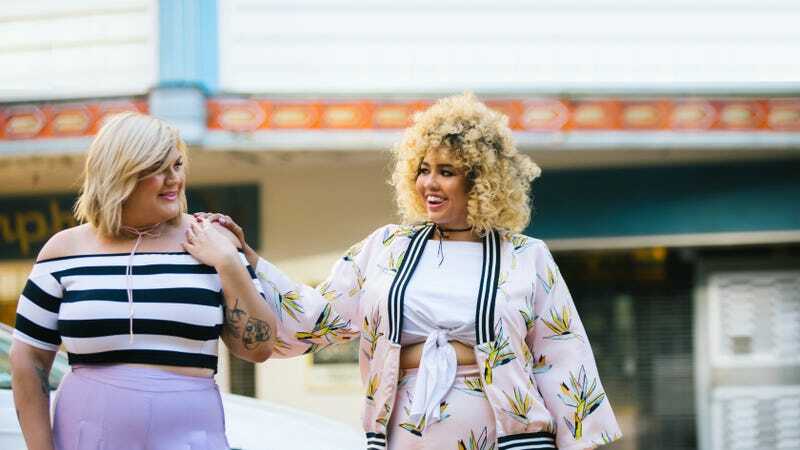 Friends and longtime plus-size fashion authorities Gabi Gregg and Nicolette Mason have launched their own label today—Premme, for sizes 12 to 30—and it looks like pieces are already selling quickly. The looks are fittingly adventurous—it’s not like we needed more black knitted options, anyway—and the collection does include quite a few crop tops. But there are also pieces for those of us who aren’t quite so keen on midsection draftiness. A real standout is that orange jumpsuit with the keyhole detail on the left, which seems like a nice happy medium. “Premme wants to give women the freedom to dress according to their personal style without giving in to the limits of society’s current fashion rules,” said Gregg, who has done several delightful and popular collaborations with Swimsuits for All. The pricing is also reasonable, especially by the perpetually pricy standards of plus-size fashion—$79 for this bomber jacket covered in birds of paradise, $39 for this body suit, $45 for this blush body-con dress. All in all, a welcome and long-awaited addition to the plus-size fashion arena.